Scottie Pippen was the perfect compliment to his Airness. Compliment. Not side-kick, not Robin, but compliment. Pippen’s individual numbers are better than he’s given credit for and the totals would’ve been a whole lot higher if he was running the offense. Pippen’s versatility and all around contributions rebounding, play making, and defending were a big reason that the Bulls were as successful as they were. 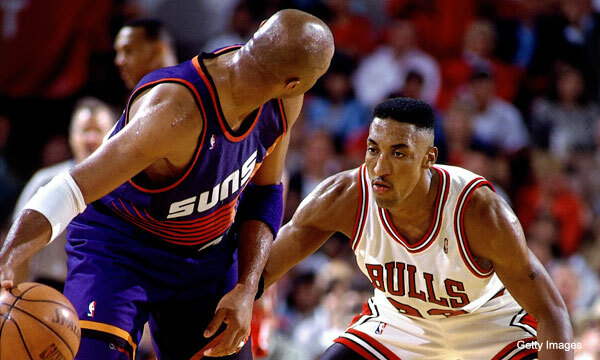 Pippen was one of the greatest defensive players ever. One of only seven players ever with eight or more All NBA Defensive 1st team honours. And one of only six players with 10 or more All-NBA defensive first or second team awards. (In case you were wondering Jordan had nine.) Pippen may have played with the GOAT but his position and rank on this list are justified. The Flag Bearer: Will Reeve (18). The Barn Burner: Matt Drappel (39). How did the other guys rank Pippen: Justin Rowan (21), Robert Littal (21), Jacob Noble (23), Marc Griffin (26), James Holas (27), Josh Eberley (30), Adi Joseph (31), Shane Young (31), Justin Salkin (31), Brian Geltzeiler (31), Justin Termine (33), and Lang Greene (33).